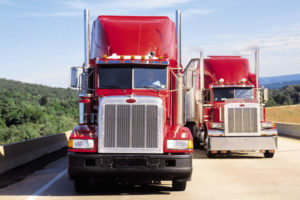 Large Sized Orders will be delivered by FREIGHT Trucks (commonly called Semi’s) that are 28′ up to 53′ in length. This means they have very limited ability to maneuver around buildings and in small parking lots. These trucks will not go over unpaved ground. Drivers DO NOT UNLOAD EQUIPMENT. You will be responsible for unloading your equipment. The driver is responsible for bringing your items to the back of their trailer. If you have access to a forklift or a loading dock that is great, but it is not necessary. When we have our install crews receive equipment on site we rarely have a forklift. Almost all equipment can be unloaded piece by piece with 2 to 4 people working together. One or two up in the truck handing down individual pieces to those on the ground. Equipment comes packed in many ways (crates, pallets, boxes, loose and sometime multiple versions of this altogether). Your quote shows where each item you have purchased is shipping from, this should tell you how many deliveries you should expect to receive. Additionally your quote often tells you whether an item ships via freight or UPS/FED Ex Ground. You or the person you designated as the contact for delivery should receive a call prior to delivery to schedule an appointment. This call will come from the freight company directly. With this call you can schedule a date and window of time for the delivery to occur. Be sure that we have a correct phone number for you or the designated contact, one that will be answered routinely or messages returned quickly. Should the freight company have multiple attempts at contacting you with no success, it is possible you will incur storage fees for your equipment that you would be responsible to pay. Lift Gates are requested for all deliveries when they are available. Most of the playground equipment that we ship is too large for a lift gate to be used. With some very light weight / smaller items (typically under 100 lbs.) we do not request lift gates in order to save you on shipping costs. It is your responsibility to count the packages / pieces and compare what you are receiving to the freight line bill and the vendor’s bill of lading before you sign. Additionally be aware of potential missing items. (ex. Your Bill of Lading says you are to receive one crate of playground equipment and that is exactly what is delivered, but you know your structure has three large slides, but you only see two in the crate.) Make note of these before you sign. DO NOT REFUSE THE DELIVERY. Inspect the delivery for any obvious signs of damage (scratches, dents, punctured plastic, etc.) and for signs of potential concealed damage (torn cardboard boxes, wrapping that has been ripped, etc.) and make note of these things on the delivery receipt and have the driver sign noting these exceptions. DO NOT REFUSE THE DELIVERY. Once delivered, do a thorough inspection of all the pieces of your equipment and bring attention to Pro Playgrounds, Inc. of any concealed damage that was not noted with the driver. You have a 72 hour window to notify Pro Playgrounds, Inc. of any and all damages or missing parts (this includes all items that were noted at the time of delivery). Failure to do so will result in a freight claim being denied and loss of your ability to receive replacement parts at no additional cost. If you find a concealed damage problem all packaging must be kept for inspection by the truck line. If packaging is discarded the claim will be denied. You will receive a packing list with your delivery (typically located with your hardware) with which to do an inventory after you receive your shipment. This complete inventory must occur within 72 hours of receipt to help make sure any possible missing piece can be replaced in a timely manner. Missing piece claims received after the 72 hours will be considered as lost by the customer and result in charges for replacement.